Life as Pink Einstein | Dallas Fashion and Lifestyle Blogger: Spring Dressing Room Try On! Spring Dressing Room Try On! Two days before Easter last year I did a post about last minute dresses for Easter and everyone seemed to love it. This year I went last minute dress shopping for Easter again but it was later in the day so I didn't get this post up in time so I thought I would make it a spring dress try on. So how this works is that all of these pictures were taken in the dressing room of Old Navy and I talk about what I liked and disliked about each dress. I will also include a link so you can buy the dresses off of their website. Just to let you know I didn't buy all of these just tried them on and bough the ones I really loved. So this year I went in looking better than last year. I looked decent and not like I just rolled out of bed. I wore my Jadelynn Brooke Easter shirt (use my code SLMHS17 for 15% off JadelynnBrooke.com) and my Crown and Ivy pineapple shorts and my $5 sandals. The first dress was really cute and I put it back by accident. It is black with a white and gray floral design. I love the neck on this dress; it comes up high and it's a v neck. I think this dress is the perfect length, it hits right above the knee so it's a good length for school too. It is on sale for $28. I was kinda iffy on this dress. I wasn't in love with this dress from the beginning but the pattern was similar to one that I really loved but wasn't in my size. The dress is navy with a bright floral print. The neck is a v neck with tassel strings that you can leave hanging or tie in a bow to create a different look on the dress. The sleeves have elastic at the end so it creates a semi puffy sleeve. This dress is currently on sale for $32 and is only available in sizes small and XS. I love this dress! The dress is a cream color with flowers all over it (just like every other dress...) and it's like an ombre of flowers. It starts with a small amount of flowers on the top and there's more going down the dress. At the bottom of the dress there is this really pretty design. I will be posting about this dress again in the near future with more detail. Just like the last dress this dress has a v neck with tassels that you can leave hanging or tie for a different look. I was originally iffy on this dress as well but I ended up buying it and I think it will look cute with a denim jacket and cute sandals. Since Old Navy uses the same few cuts and styles of dresses I didn't think this dress would fit. Last year I tried on a few dresses in this cut and they were too short but this year this style actually fit! This dress is the same pattern as the other blue floral dress only the pattern is smaller. It has the spaghetti straps and it zips up the side. This dress is currently on sale for $15. I just wasn't feeling this dress. It looked like I was wearing a sack. The dress is black with pastel orange, green, and gray flowers and it has a v neck and a cutout in the back. This dress is currently on sale for $14. I have been wanting this dress since it was posted on the Old Navy website!!! My dad found it buried in the sale section and it was in my size. It is a light, super soft, tee shirt dress with navy and white stripes and a tie neck. I definitely recommend grabbing this dress if you get the chance. This dress is on sale for $16.97 and is available in all sizes. This is the dress I ended up wearing on Easter. The dress is white with red, blue, and yellow flowers all with green leaves. The dress comes in at the waist and it button in the back. The dress come just a little lower than the knee. Originally I was going to put this dress back and I am so happy I didn't because it is so pretty! The only down side to this dress is that it isn't lined and since the dress is such a light color it is see-through so make sure that if you get this dress you grab a slip to go under it. I couldn't find this dress on their website. I loved this dress on the hanger. My dad found it but of course it's a medium. I wanted to try it on anyway just to see if it would fit and it didn't. It may be hard to see in this picture but it looked like I was wearing a sack. The waist comes in but the waist of the dress didn't even touch me so it looked very awkward and it was like a midi dress on me but you could tell that it was supposed to be knee length. But overall it is a beautiful dress. I love the cap sleeve and the pleating at the waist. The dress has navy and white stripes and is a great material. I could not find this dress on their website. 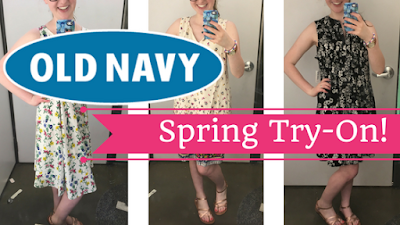 Looking back on my Old Navy Spring Favorites post this is one of the dresses I talked about. It is another tee shirt dress that is red, white, and blue. It is super comfortable and the it is knee length. This dress is sold out online in all sizes except a 1X so I linked that one above. This dress was really pretty on the hanger but not on me. Since I was only trying on dresses I left my shorts on and it didn't help the way this dress looked on me. This dress was like the Old Navy version of a body con. It was a tee shirt dress but it was tight. The material was great and I loved the navy and white floral pattern but tight dresses are not my thing. The dress in this pattern is sold out on their website but I linked the dress in the patterns available. That is all for this year's Old Navy spring try on! If you enjoyed it let me know by clicking the "Like" button at the bottom of this post.